Welcome to Noosa Bridge Club. The Noosa Bridge Club is located at 3 Wallace Drive, Wallace Park, Noosaville, (see map) in its own architecturally designed building. 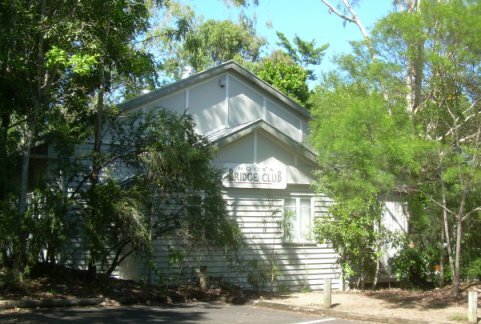 Located between Wallace House Art Centre, and the Noosa Library, the Club is easily accessible from all parts of the Sunshine Coast, and parking is available adjacent to all these buildings. With approximately 400 members, we run six sessions a week (see Session Times). The Club has a strong commitment to player development. We have Beginners' Classes at least once a year which include supervised play sessions on Monday mornings during the 8 weeks of lessons. On a Wednesday you may come as a single and we will usually find a partner for you. In addition, we offer frequent tutorials to help players improve and consolidate their knowledge. See Breaking News to the right to find out what's on. Several open events are held during the year, and all players are welcome to join in. Entry forms and other information can be found in the Events section. Visitors are always very welcome. Should you be without a partner for any session, ring the partnership arranger to find out if a partner is available.